For the Sega Game Gear game, see Ristar (Game Gear). Ristar, released as Ristar The Shooting Star (リスター・ザ・シューティングスター) in Japan, is a platform game developed by Sega released for the Sega Mega Drive. It was a late era Mega Drive game and therefore never got much exposure compared to similar platform games released for the same consoles. In Ristar, we follow the story of a far away solar system, Valdi, that was corrupted by an evil tyrant called Greedy. Greedy forced the leaders of each of the seven planets the system is composed of to work for him, enslaved the people and kidnapped Ristar's father. Desperate, they make a plea for help. It is answered by Ristar The Shooting Star, a tiny humanoid yellow star with long, elastic arms. To free the population and liberate his father, Ristar must fight Greedy's minions throughout every planet, restore the leaders and eventually fight Greedy himself. Ristar is very different from Sonic in one aspect, however, and that is Ristar's ability to explore worlds underwater without needing to breathe. He can also swim underwater with ease. Earning points comes mainly from toppling enemies (generally gives you 100 points) and yellow gems which are worth between 100 and 1000 points, depending on how hard they are to reach. Planet Flora is the first level of Ristar, and is a generic tropical island cliché, with lots of vegetation similar to the flora found in Sonic games. It is pretty easy and mainly about getting used to the controls. The second zone includes a darker jungle setting. Riho, the boss of Flora, is also easy to defeat. Planet Undertow is the aquatic ruin level where nasty fish foes abound. This planet gives you the opportunity to try out Ristar's underwater swimming abilities, though be aware it's rather tricky to grab things here. The background in the first zone, like in Planet Flora, is a bit lighter than in the second zone, which is made of a totally submerged series of tunnels, with few to no dry land. The boss here is Ohsat, a hammerhead shark. Planet Scorch follows the archetype of the fiery industrial world and is considerably harder than the previous planets. The second you land on the planet you'll face a rain of flaming meteors which only goes away a few seconds after. Scorch also requires a high level of mastery of all the basic skills (jumping and grabbing). There's a mini-boss involving a memory game between the two zones. The boss is Adahan, a huge robot mole. 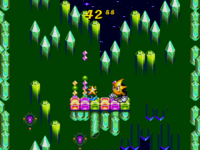 Planet Sonata is considered by many players the most creative stage in Ristar—even one of the most original stage to ever appear in a platform game at that time. Sonata revolves solely around music and the level is vastly decorated in a musical theme: grabbing poles are flutes and, handholds are trumpets and enemies even launch dangerous musical notes at you! The first zone (which takes in a strangely futuristic background) is made of four sections and in each of these sections there's a very singular objective: deliver metronomes to the songbirds so you may advance through the level. The mini-boss consists of toppling three mechanic bird heads. The second zone is much more related to disco/dance, especially the background music, though apparently it takes place in some kind of dark castle or chamber. Awaunek, a giant hawk, is Sonata's boss. Planet Freon is an ice planet. The first zone is child's play, with lots of spinners and slippery floors. Throughout all of this zone you'll be closely followed by a strange alien who you'll fight at the end in a peculiar snowball fight. The second zone is nowhere as easy and consists mostly of swimming around in near-frozen water. In the boss zone, the strange alien guy who stalked you during the first zone will actually aid you in defeating him—this is done by hurling steamy pizzas (pies?) provided by him into Itamor's (the boss) mouth. Planet Automaton is a mixed bag: the second zone and the boss to some extent are a pushover, though the first zone is incredibly challenging—it is also somewhat similar to mechanical levels in Sonic games like Scrap Brain Zone and Metropolis Zone. Automaton's boss is Uranim. Castle Greedy is where the last fight with Greedy happens, although you will still have to go through another mini-boss before him inside his spaceship. In bonus rounds, you will have one minute to attain a treasure chest and collect one item; the first bonus round is very easy and consists of only one spinner but they eventually get more and more bothersome. You only have one try for each bonus round. Also, completing them very rapidly will get you one free continue. The items in the treasure chests are useless themselves but in the end of the game if you have enough of them you'll earn secret passwords. Ristar allows you to input codes in the options menu, which can result in different styles of play, among other things. If a code is not 6 letters long like SUPER, then any character can be added after the password and it will still work. SUPERB is a very common example. The game will reveal various amount of letters of four passwords, 6 letters each, after the ending depending on how many treasures you've collected. There are 12 treasures to get in the game. Super Hard password gets revealed if you beat the game on Hard difficulty no matter how many treasures you have. MAGURO "ONCHI". Onchi Music mode and credits music in sound test. No 1st password revealed after ending by collecting treasures. MUSEUM "BOSS". Boss Rush mode. No 2nd password revealed after ending by collecting treasures. ILOVEU "RD.SEL". Stage select. No 3rd password revealed after ending by collecting treasures. DOFEEL "ATTACK". Time Attack mode for bonus stages. No 4th password revealed after ending by collecting treasures. Get all 12. SUPER Super Hard mode. No Revealed at the end of credits on Hard mode. Ristar's gameplay alone has garnered it lots of comparisons to the early Sonic games. The most significant link between Ristar and Sonic is the fact that Ristar was built on the Sonic 1 engine, including the level engine and music engine. Another strong link to Sonic was the prototype design of Ristar, named Feel — the character had a striking resemblance to Sonic, being a spherical yellow and black "rabbit," and even had identical shoes. Ristar also performed cameos along with other Sega characters in Shenmue, Segagaga and Sonic & Sega All-Stars Racing. It was re-released in 2002 (JP, NA) / 2003 (EU) as part of the Sonic Mega Collection on the Nintendo GameCube and in 2004 (JP, NA) / 2005 (EU) as part of the Sonic Mega Collection Plus on the PlayStation 2 and the Xbox. To play Ristar in the GC edition, you must play Sonic 3 and Knuckles, Flicky, Blue Sphere, and Knuckles in Sonic 2 30 times each; in the PS2/Xbox edition, you must play them 20 times each. The JP version of Ristar was not only released with a different title but with secret characters, among other things. One of the most well-known secrets was the intro: you can see a huge green star being—supposedly Ristar's father/mother just before Ristar is awakened by the plea of help from the populace. Actually, the green being is known as Oruto, who has a cluster of stars. She selected Ristar to fight Greedy. The ending was also different since you don't see Ristar running to his father's arms. Note: Osamu Hori may have either been the lead programmer or his code on Honoo no Toukyuuji: Dodge Danpei was used as a basis for Ristar's (Pyramid Magic needs to be checked).